Her Majesty The Queen in a hat from the past. From the Elizabeth II 60 years of hats gallery at the Global Post. Click to view. I can’t write it better, so I’ll quote Barbara M. Neill writing for the Pittsburgh Post-Gazette in 2011. In an age when few people wear hats on a daily basis, consider this: Queen Elizabeth II, whose rule began on Feb. 6, 1952, has had 5,000 hats protecting her pate during her reign as England’s monarch. Considered substitutes for the royal crown, hats enable Queen Elizabeth to be easily identified in a crowd, shield her from the glare of the sun, add height to her diminutive stature, and supply a bit of flair for her rather lackluster color-coordinated wardrobe. Her Majesty’s hats also act as cover-ups, eliminating the need for constant hair-tending for a woman whose existence is an endless round of appointments, appearances and activities. The queen’s fashion sense has often been considered suspect and sometimes downright dowdy. In Elizabeth’s defense, her attire was long chosen by her greatly loved but distinctly unfashionable maid, the now-deceased Margaret “Bobo” MacDonald. However, the monarch’s taste in hats is nothing short of whimsical. 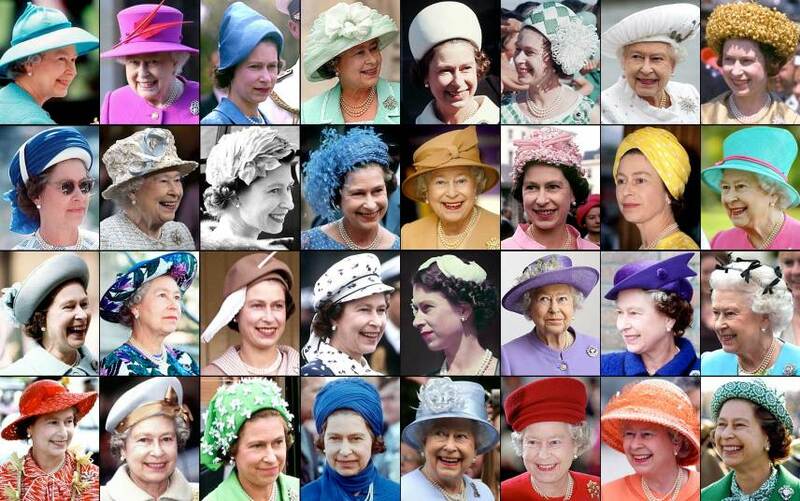 Given her nearly 60 years of sovereignty, Queen Elizabeth’s hat selections have been remarkably diverse. These royal bonnets are highly prized. As rich as the horse-breeding, dog-loving, tea-brewing monarch is, she isn’t a snob about her treasured hats, wearing some favorites 20 to 30 times. Occasionally, the queen chooses to wear a chapeau only once, such as the one worn for the millennium celebration. Aside from events in her kingdom and important family occasions, hats are often designed for the queen to be worn on royal tours of foreign lands. These creations may incorporate cultural features of the locale, while always respecting that country’s customs. Regardless of where or when her hats are worn, there are no knock-offs for HRH. Since assuming the throne, Queen Elizabeth has kept her milliners quite dizzy designing the constructions that complete her outfits daily. A replica of her head is even said to grace certain hat-making establishments. One blog that Hattingdon and I follow is the Royal Hats blog run by a lady who identifies herself as Hat Queen. We adore her and her blog. Take a look at the rainbow retrospective of HM’s hats HQ has done in honor of Her Majesty’s 90th birthday today. We have been so busy looking at it we almost forgot to post! Here’s one that was created earlier. Collage of HM Queen Elizabeth II’s hats over the years. Wonderful. Google image. Hattingdon of course has a royal headdress of her own but she rarely wears it. We thought it would be fun to show it to you. This confection is from 2009 and not based on any one crown but a lifetime of looking at them. So this “hat” is an amalgamation of sorts strictly from my own imagination. Royalists will definitely see the influences. Regina design created by ©Vivian Grant Farrell for Hattingdon Horses®. From 2009! The design is called Princess Hattingdon and was retired from the shop in 2014. Happy Birthday Your Majesty. Long may you live. Long may you reign. Long may you prosper.